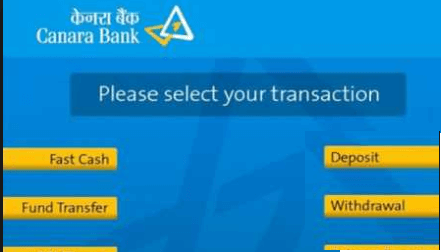 In this post, you will know how to activate New Canara Bank ATM Debit card after opening a new account. Canara Bank is India’s largest public sector Bank and according to Wikipedia, it has a network of 6639 branches and more than 10600 ATMs spread across all over India. You can open a normal saving account in Canara Bank with just Rs.1000 Deposit with all banking benefits like ATM card, Cheque Book, Passbook, Mobile Banking and net banking. You can also open Basic zero balance saving account under Pradhan Mantri Jan-Dhan Yojna. So you just opened your New Saving Account in Canara Bank and received your ATM Card. The Bank offers Rupay ATM Debit card which works well online and at ATM. You can also upgrade your card through request. See how to Activate your New Canara Bank ATM card. After the account opening process, the Bank offers you instant ATM card and physical PIN. This instant ATM card is not active. You can also apply for a new personalized Debit card with printed your name but you need to wait for the physical PIN for that. Wait for 24 hours after getting ATM card and PIN so system updates your details. 1- After 24 hours, the next day visit nearest Canara Bank ATM. 2- Insert your new card and ATM PIN. 4- After amount withdrawal, your new ATM card will be activated instantly. You will receive an SMS on your registered mobile number. After card activation, now you can use your card for online purchases too. You can also register for mobile banking and net banking after activation of your new card. I hope you now understand how to activate your new Canara Bank ATM card after account opening. If you applied for the personalized card then wait for the physical PIN and then follow the same process.